This lens is extremely interesting. Its lens mount is of the "original K-mount" type, and its name associates it undoubtedly with the M-series of K-mount lenses. On the other hand, the lens shares its most important characteristics with the later SMC-A lens: the linear aperture mechanism and the updated optical formula. 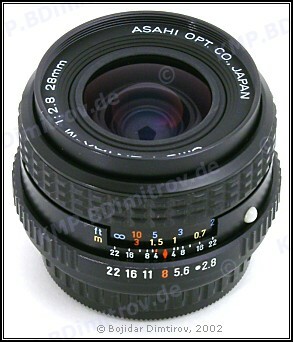 Even the focusing ring is of the A-style. Guesses can be made that in 1982 Pentax was already hard at work developing the A-series bodies and lenses, and when parts for the "original" M 28/2.8 lens were depleted, it was decided to switch to production of the new lens, but without exposing the externally visible A-series features — electrical contacts on the lens mount and "A" position on the aperture ring. Still, this lens with its low production numbers is a rather unique piece of K-mount history.